EARLIER TODAY, THE Supreme Court ruled that two separate challenges to the State’s decision to award Ireland’s second mobile phone licence to Esat Digifone can go ahead. The decision has been welcomed by two of the major players in the awarding of the licence back in 1995 – then Communications Minister Michael Lowry and Esat Digifone’s Denis O’Brien. I welcome the Supreme Court Decision to allow the losing consortia to challenge the 1995 mobile licence decision. I have always advocated that a Court of Law with its established rules and procedures is the proper forum to critically probe the process. Shortly after the licence was granted and the losing consortia started a campaign to undermine the process, I as then Minister invited and encouraged the losing bidders to seek a judicial review of the process. They declined that request. I welcome the fact that 17 years later the Supreme Court is granting them the opportunity to have that decision tested in law. I sincerely hope that the consortia involved with the claim will now belatedly proceed with their legal challenge. I am happy that the losing consortia’s court challenge will be governed by strict rules of evidence where facts must be established, where the sworn evidence of those who know the facts such as more than 17 civil servants and all others involved in the process will have to be accurately adjudicated on to the exclusion of hearsay and opinion. This claim is without merit or substance and should be vigorously defended by the State. Denis O’Brien welcomes today’s Supreme Court decision allowing for the continuance of the damages claims being advanced by Persona and Mr Declan Ganley arising from their failed involvement in the second mobile phone licence competition process held in 1995. Mr O’Brien is a Defendant in the claim being misleadingly referred to as “the Comcast Claim”. However, that claim is not being supported by the Comcast Corporation. Indeed, the sole Plaintiff in that action is Mr Declan Ganley suing in a personal capacity. The consortium in which Mr Ganley was involved came last out of the six applicants in the licence competition process. Persona is a limited liability company owned by Mr Tony Boyle and Mr Michael McGinley which exists only to pursue a damages action against the State. Mr O’Brien will fully and vigorously defend all relevant allegations made in relation to the licence competition process. Esat Digifone Limited won the second mobile phone licence competition process 17 years ago for the very simple reason that it submitted the best bid out of the six applicants. That Esat Digifone submitted the best bid was the firm and unequivocal evidence given by every single civil servant involved in that licence process from two Government Departments; as well as the evidence given by Professor Michael Andersen of Andersen Management International; the leading Danish consultants who devised and conducted the licence competition process and who had previously been involved in some 120 such licence competition processes around the world. Mr O’Brien looks forward to the Irish State also vigorously defending these proceedings in order to maintain and protect the integrity and reputation of the Irish Civil Service and of the individual civil servants involved in conducting the licence competition process. One of the businessmen involved in one of the consortium’s who had its bid rejected was Declan Ganley, who told TheJournal.ie that he was ‘chuffed’ with today’s decision. He said he will pursue his claim for damages with vigour. 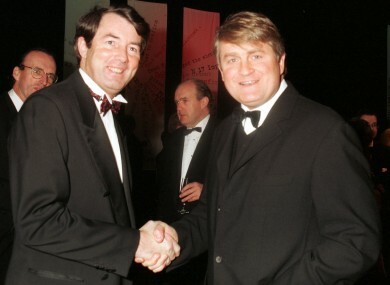 Email “In full: Michael Lowry and Denis O'Brien's statements on court ruling”. Feedback on “In full: Michael Lowry and Denis O'Brien's statements on court ruling”.